Thank you for donating to The Bridge Hospice – your gift will be used with great care! If your donation is in honour of a loved one, please let us know! The Bridge Hospice provides care at no cost to our residents and their families. Our residential hospice offers many benefits to individuals at end-of-life, their families and their communities. Our home offers the best of care and comfort measures in a dignified and tranquil setting. Our residents are relieved to know there is professional care at bedside 24/7. We alleviate families of the burden of managing care and support them throughout their loved one’s journey. There is a significant cost benefit to our healthcare system as well. Residential hospices provide care at approximately 1/3 of the cost of hospital care and frees up vital acute care and emergency beds. At The Bridge Hospice, approximately 60% of our costs are related to the provision of health care by our nurses and personal support workers. These costs are now funded through the Central East Local Health Integration Network (CE LHIN) and augmented through a partnership with Saint Elizabeth. The remaining 40% of our expenses are not covered including vital day-to-day operational costs. These funds are raised through donations, grants and special events. Please consider giving – all donations are treated with great care! Each donation is treated with great care and helps us to maintain our warm, welcoming hospice home. Make a donation in memory or celebration of a loved one. This meaningful gift can express your support during a difficult time. A card will be sent to the family acknowledging your donation and you will receive a charitable tax receipt. Donations can be made by any of the above methods or through your local funeral home. Consider making a gift to honour a special person or an occasion like a birthday, anniversary or wedding. A card will be sent to the gift recipient acknowledging your donation and you will receive a charitable tax receipt. Donations can be made by any of the above methods. Consider remembering The Bridge Hospice in your will. Your gift is a thoughtful way to help others and to leave an enduring impact on the community. 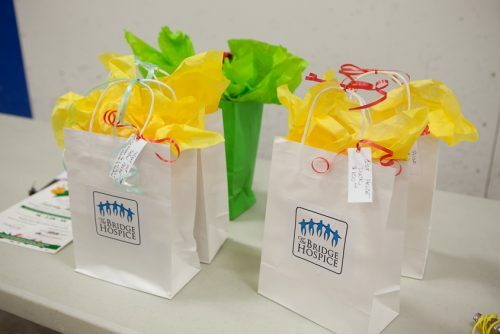 Your gift provides financial support for The Bridge Hospice as well as personal tax benefits. Participate in our Spring Walk, Golf Tournament and/or W8 Run. Collect pledges, sponsor an event or support an active participant. We truly appreciate all forms support! Help us reach our fundraising goals by hosting an event in support of The Bridge Hospice. We will provide you with an “Event Kit” to support your efforts. Please contact us for more details! If you’re heading out for a shop, consider picking up any of the items on our wishlist that help us make our hospice guests feel at home. On occasion we have larger item needs – we update our wish list regularly.